As you probably know, it takes quite a long time to prepare a full blog entry with photographs and I walk an awful lot so have limited time to spend at my computer. This means that there is often quite a long gap between posts. I thought therefore that I would occasionally post a ‘Daily Picture’ in between my full walk blog posts – this is the first of those and I hope you like it. This picture which I called ‘Helping Hand’ was taken yesterday on a gentle walk along the sea front. 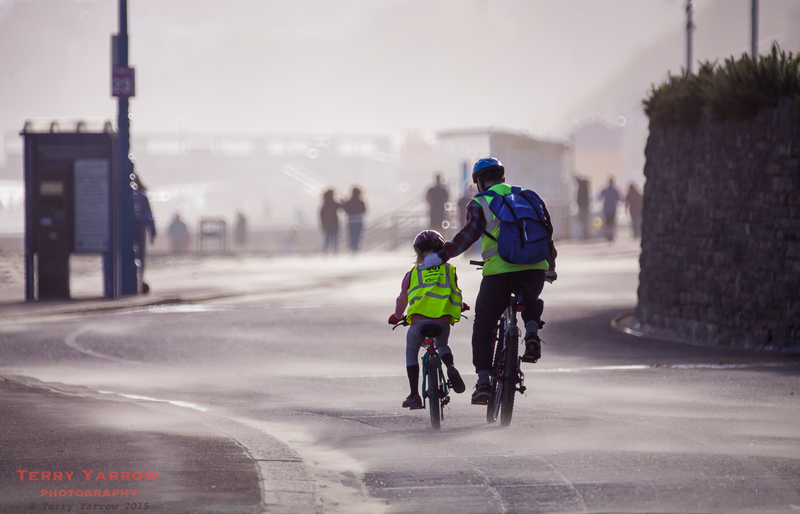 These two cycled past me and the little girl, who I think is probably the granddaughter of the man in the picture, was struggling against a stiff head wind so he put his hand on her shoulder to give her a helping hand. I found it quite a moving scene because it made me think about my own grandson and the privilege we have as grandparents, along with the parents, to have an input into the lives of our grandchildren, helping them to grow into fine adults. This responsibility and privilege is something that I really treasure and I thought I would share this picture with you. On a technical note, the picture was taken with a modern digital camera but the lens I used is a 40 year old manual focus 500mm Cat lens. This pre-dates autofocus and is a difficult lens to focus manually – in fact its a difficult lens to just hand hold – but it has a lovely shallow depth of field and separates out the subject beautifully from the background. When they passed me, I had to quickly grab my camera and run into a position where I could capture the shot. There was very little time because they were disappearing into the distance so I was really pleased with the way the shot came out. Incidentally, the light colour on the road is sand being blown along the road by the wind. A very touching photo indeed. And I agree wholeheartedly with the idea of you’re putting up pictures in between your longer posts. Wonderful.